First off, thanks for making 2017 a great year for us. We made a lot of beer, burgers, and cocktails. in 2017 We remained focused on our SMASH series of beers. We regularly switch up our seasonal cocktail menu with new hits each time. The burger, well we didn't change a thing, cause why fix what isn't broken. We also taught consistent home-brew classes every month, teach a lot of new brewers the ropes. Thanks to all you who support Black Sands. In 2017 we remodeled out homebrew shop to be a more all purpose space. We now offer 3 different drafted beers in the annex, and cold brewed nitro coffee. We also host pop ups regularly in the space to activate it with fun and interesting offerings from our friends and colleagues. Black Sands is giving back by supporting pop ups. We started as a pop up in the restaurant world and host various pop ups including friends Automat, Le Dix Sept, a Flower Shop, and Shinobi! Contact us if interested in popping up at Black Sands. We love supporting the right next generation of small business entrepreneurs. SF Beer Week 2018 starts February 10th. Check out the schedule for all listed events around the bay area. Come visit us at the opening gala party where we will be pouring the latest Black Sands beers for all. You can grab tickets to the gala here. All during beer week (feb 10th -18th) We will be having our annual SMASH fest at Black Sands. Six different Single Malt and Single Hops beers on draft all week long, or at least until we run out! Come grab a taste of our latest SMASH beers. We have been aging some special beers in barrels and they are set to be tapped during beer week, stay tuned for details, but we plan to have a special event in our Annex space to celebrate these beers. Follow us on Instagram and Twitter to get the updates! We'd like to introduce our a partner that we are working with to create a new coffee offering for Black Sands. We did a blind taste tested a wide variety of different coffees from different suppliers, and narrowed to a brand and taste we really love. We are excited to start working with Tartine Coffee Manufactory. Roasted in Oakland, and ground fresh daily. Come give it a try starting next week. And moving forward we’ll be swapping coffee partners seasonally to showcase the amazing work of local and national roasters! The Black Sands Squad unites to say happy holidays. This is us at our holiday party.... what an awesome crew we have. So proud to have all these quality people helping us run this ship. And as the seasons shift we’re in search of ways to warm our hearts, and entertain our thoughts. We match rainy cold days with warm meals, uplifting spirits, new beers, collaborations, celebrations, and huddling closer together. We wish you warmth this holiday season. Oil as embers. Our coffee milk stout is freshly on tap NOW. Barrel Aged Kings Tide. Our base french Saison recipe aged in a Pinot barrel will be released in January. Barrel Aged Midnight Rye. Our Black Rye IPA aged in a Rye Whiskey barrel also to be released in January. SMASH Equinox collaboration with Copper Fox. Rice Paper Scissors collaboration beer. During beer week this year we will also be releasing a special collaboration beer with Golden Gate Cider. We’ll be making a Graff with them that is inspired by Steven King’s dark tower novels. Intrigued? A year’s end is a time to look back, and see what worked, what didn’t… but more importantly where did you have the most fun? And how can you do that more. We had a number of pop up parties on our off day (Monday’s) this year where we invited friends to come in, use the space, and try something new. We are planning more of them in 2017, and potentially even Sunday night collaborations with chef friends. Stay tuned for more Monday / Sunday events. Lunch and Brunch are popping! We are putting even more love into these programs in 2017. Look forward to some new awesome brunch dishes in January like Schnitzel, pancakes, and Vietnamese Beef Stew, and more improvements to the Lunch program too. Beer week is something we look forward to all year. We have been brewing SMASH after SMASH to get ready for our signature event again: SMASH FEST. SMASH stands for Single Malt and Single Hop, and its a beer style we are truly focused on. Just like last year we will have 6 SMASH beers on tap all week long during beer week. After almost 7 months of permits, legal hoopla, red tape, and government approvals we finally have our self distribution license! What does that mean? Well, it’s a big deal to us because essentially we can MAKE MORE BEER. But, more importantly it means that we can take that beer, and then deliver it to other locations in the city. Primarily we’ll be focused on supplying some friends and enthusiastic establishments that want to serve Black Sands beer at their restaurants and bars. Starting early January we will begin selling a series of our SMASH beers to select draft-only accounts, and we will continue to do that each 2-3 weeks for all of 2017. Touch base with us if you are interested in carrying our beer at your establishment. Shoot us an email at blacksandsbeer@gmail.com if you are interested. Do you like drinking beer past 11pm? Sometimes we wish we could let you. So we have been working on getting the right approvals for being open to later hours. After a lot of paperwork, letters of support (thank you! You know who you are) and a public hearing, we can officially be open until 2am on Fridays and Saturdays. We will also be extending certain weekday hours to midnight. We will be hosting a special pop up brunch, to be catered by Rice Paper Scissors on New Year’s Day. From 11am - 2pm a traditional Vietnamese new years brunch will be served. We will also be releasing our Rice Paper Scissors collaboration beer. This is a light, crisp petite saison recipe infused with Vietnamese Jasmine rice, Vietnamese Black Rice, Jasmine tea and roasted rice flakes. We will be ultra carbonating this light ABV beer to provide a light crisp compliment to the tasty and sweet food options by Rice Paper Scissors. Please take note of our hours during this lovely holiday season! Back to our normal hours in the new year. In 2017 we are starting to bring the sharing philosophy over to our spirits side of the bar. We will be starting with an introduction class to cocktail mixing. Participant will learn the tools, techniques, and ingredients to simple cocktail mixing. Learn from our pro bartenders, mix drinks, and socialize around the art of cocktails. Classes will start in January, so stay tuned for more details and dates. We now have official gift cards. These can be ordered for any amount, and can be used at the bar, for food, or at the homebrew store! Just order them online, or at the bar, and swipe just like a credit card. Last August we brewed our first batch of beer, fired up the burners, raised the sails and left the harbor. We’ve weathered the storms and the dark waters, and after the first 12 months the ship is sailing smoothly. We've battle tested everything from food, to beer, to cocktails. Thank you to every crew member, and passenger for getting us to this point in the journey. It's been a wonderful year at sea. Here are a few highlights, upcoming events and surprises! We've been very busy this year. The fermenters are full of new beers every week. The kitchen fires are burning 6 days a week, and the cocktails are flowing. Here are a few highlights from our first year. We've brewed a lot of beer this year with a primary focus on our Single Malt And Single Hop (SMASH) series. Our SMASH beers allow us to focus on just one malt and one hop. In comparison, most IPA's on the shelf have up to 8 different grains, and 3-4 varieties of hops. By simplifying our ingredient list, we are able to focus on the unique characteristics of each grain and hop, and better educate everyone on what is in their beer. Our SMASH beers are simple, transparent, and delicious. Of the 64 batches of beer we have brewed this year, 25 have been SMASH beers. By brewing this many we have learned a lot about the process, and we better understand what you like in your beer. Here is our SMASH beer list, in chronological order from this year, with a few more in the fermenter now. Next year we plan to SMASH even more. Come visit us this Wednesday for a special event with Seven Stills. They made a beer, and then made a whiskey from that beer. Fluxuate coffee porter brewed with black medicine coffee is the beer, then distilled down into a whiskey. Get a beer and shot pairing! Extremely limited release. Join us from 6pm - 10pm or until the supply lasts. We found ourselves a port barrel that was used to age an Angels Envy whiskey. We then re-soaked that barrel in port for 3 weeks. After that we filled it up with our french saison. The result is a barrel aged saison with notes and flavors of the history of the barrel: whiskey and port. It has been aging for 3 months and we are going to tap it Tuesday August 9th. This batch of beer is being split in two. We are putting half of it on tap directly to taste. The other half is going into a Spirit Works rye whisky barrel for a few months to age. Release date on the barrel aged half is TBD. One of our favorite SMASH beers, this time DOUBLED. Nelson Sauvin hops hailing from New Zealand have a fantastic dual purpose character to them. Our SMASH double Nelson has a balanced bitterness, with flavors of blanc grapes and stone fruit. Easy on the bitterness, heavy on the aroma. We are constantly pushing to deliver quality food that pairs perfectly with our latest beers. A new menu is coming in the next few weeks with additions like a baja fish burger, and more variety to burger add-ons. Join us this month to try all the new dishes. We designed and built our ship, our escape. We planned the launch. We conquered some rough seas over the past year, but we left the dock with a dream and a great crew. This year has been one of the most rewarding years of our lives, and we thank you so much for helping us along the way. Now we scan the horizon for new quests, and plunder. Remember young children of the sea: nothing ventured, nothing gained. What were you envisioning when designing the Black Sands menu? Share with us your process and its evolution. Ultimately delicious food that goes well with cocktails, something that is approachable to the neighborhood, and is enjoyable with beer. I never wanted the menu to be “mine” or something that chefs only would eat. I really spent time asking neighbors and people in the neighborhood: “what do you see coming in for regularly” and I got responses like “they wanted a really good burger, they wanted fries, but they all demanded something more creative and substance. They wanted something with soul and substance." From the beginning I’ve been trying to make tasty food that goes well with booze. Now I’m really trying to round out the menu and even out the selections and balance a well rounded menu. Not interested in just selling a ton of burgers and nothing else, but something balanced and we are getting to that point where things are ordered evenly. What are some of the challenges with menu highlights? The burger for sure is one of our most popular and in demand products. Its really hard though as a cook to keep customers happy since supply of ingredients can make things difficult. For instance I’m going through this dilemma since tomatoes are out of season, there is a lettuce shortage and I’m working to keep the integrity of our burger even though things change seasonly. I’m trying to create a new diner style winter swiss mushroom burger with herb aioli - all to keep people happy and not mess with customers while dealing with supply issues. It’s a difficult proposition to keep constancy, customers happy and deal with realities. On that note what is your philosophy regarding sourcing? As a new restaurant I really try to be logical and we try our best to support local farmers, but in this stage of the game, it's more logical to buy the best ingredients we can get that match our goals. So when is it ok to cut corners? Cutting corners depends on the eye of the beholder. The corner is in the eye of whom is cutting. There is being lazy and there is being efficient…so if one is cooking with integrity there is no corner being cut. In the end if the food is delicious there is no corner being cut. For example, we buy mayonnaise in bulk, to some it might seem a corner is being cut that we don’t make our own but to me its more important to focus on elements that really matter, and taking this efficient step leads to better food, faster service. Talking about fries what is your attitude towards fries? 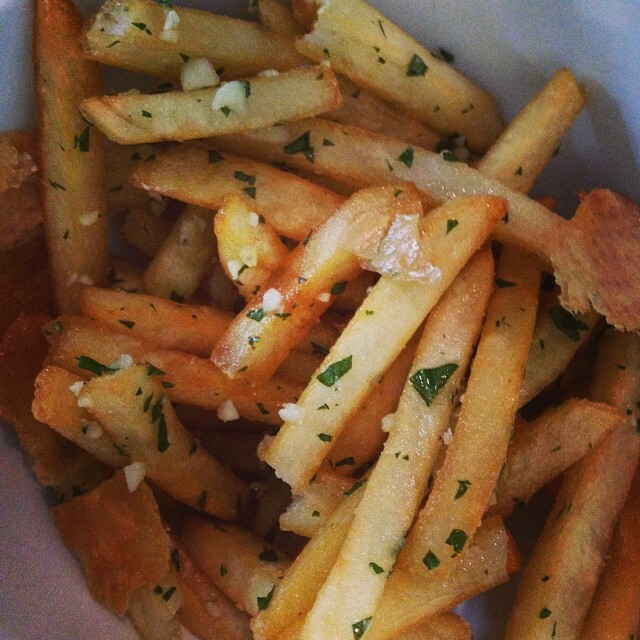 As for fries, everyone loves fries. I originally staged at Bouchon, one of Thomas’ Kellers restaurants in Yountville, who many consider has some of the best fries in the world. For a long time no one knew that his fries were bagged frozen SYSCO fries that are really well fried. Going back to cutting corners, this is a great example, there is no restaurant in France that does volume and hand cuts their fries. It's not worth it. Better technique in this example leads to better taste. I would trade an hour of good technique here vs cutting fries everyday for an hour. All this influences our fries. Originally I started with bagged fries but after building a team, we went about making some awesome fries that wouldn’t break the bank and were manageable to make. We decided to make fingerling fries. The fingerling fries are cooked three times and then fried and make for a crispy outside, creamy inside but are easy to prep. Is it better to have polarizing dishes? Our fries for instance are polarizing, people either seem to love them or a a little bit taken back by their untraditional style. I’ve never heard anything negative about them aside from that they feel fancier. They are indeed fancy, organic potatoes from Oregon. If we put something on the menu, it needs to be awesome. Not perfect but awesome. I’m working towards that. What is the vibe you are trying to create with the food? The vibe is having a whole bunch of small hand held bites that are easy to share. Customers are 50/50 in how much they want to eat. Early customers come in a full meal, and those people are inclined to have fuller dishes, but after the night progresses people want more bar food. I try to balance those two types of customers in the dishes we make. Everything we make has something nifty, and special and have been trying to use beer in a lot of the prep and cooking. I’m using hop infused oils in the brussel sprouts, stewing our chicken in beer etc. I’m not interested in confusing food but good food. Is the food Californian food then? This is definitely San Francisco food. San Francisco people are gourmands. People here are very educated in produce, meals, and have good ideas about Chinese, Japanese and Latin ingredients. Here everything meshes. The audience is quiet savvy. I hear people sometimes talking who don’t even work in food and I’m like jesus “wow they know soo much about food”. It's great and people are awesome because they aren’t confused, order food and enjoy. My short ribs for instance are meant to be eaten with their hands and the best customers go to town with these. They just go at it. What is your favorite vegetable to work with? Umm. Broccoli. I like all kinds of broccoli. My favorite thing to do with broccoli is to cook it over smoldering wood. I like to grill it over burning wood with a little chard to it. Just lemon, olive oil and salt. Its just fantastic. I would love to serve a plate of broccoli like this, but some people might get confused. My favorite foods are very boring - something like classic ginger scallion noodles with a fried egg. Fried rice with garlic and crab. Simple beautiful food. What are some of your favorite places to eat? Capital. It's a classic Chinese american diner in Chinatown. They have a daily special; yesterday they had this pork chop with bagged cooked veggies. Simple with two scoops of rice. It's a legacy of the cross over of American and Chinese day laborers and food that appeals to both. I like really unassuming places that have a great authentic purpose and offering. I also like this placed called Mickies, this homey Japanese restaurant in San Francisco. Super homestyle place with signature fried garlic over noodles. Excellent glazed crispy unagi. What is your spirit of choice? I like clean simple drinkable beer… I love our beer. I love the Smash Nelson. I’m not so into hoppy beer. I like beer that I can drink a lot of. I like refreshing beer I can drink through the night. As for booze goes, I like it all. I’m in a gin phase now. I like it all. I like a Negroni. For most people I think luxury would be getting dressed up and experiencing interval prix fix meals, but that to me is stuffy. Luxury in my eyes is going to Swan Depot, alone no line, an Anchor steam, crab, uni, clams. The pinnacle of luxury is whatever you want when you want. What would you like the customers to know? What is something you would share with everyone who sits down to know? I want people to know that there is a lot of substance, and heart, people who genially care about their experience. Being a cook is hard but its nice when people understand all the work that goes into everything from making beer to putting a burger in front of you. I want people to know that there is a lot of heart here - there is. Dear drinkers of the Black Sands Liquid Gold, thanks to your support, your hunger and your thirst our first two months together have been really exciting. The brewery is locked and loaded, pumping out about 4 house made beers a month. 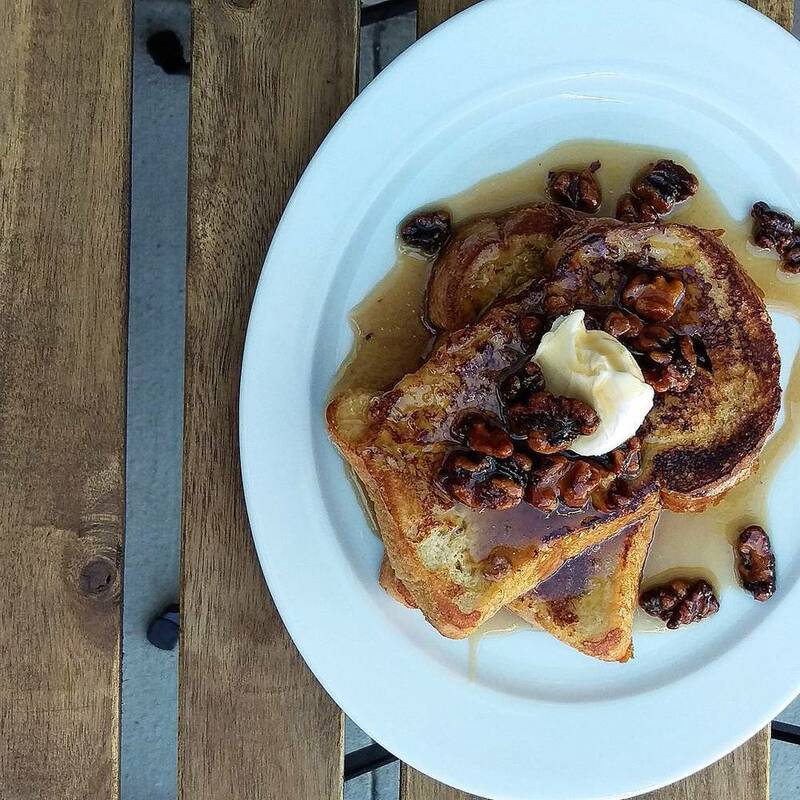 The Kitchen is fully operational serving beautiful dishes for breakfast, lunch and dinner. Coffee is brewed hot and cold, and even thrown into some of our beers. These first few months, the most exciting thing is to be delivering the full Black Sands Experience to everyone who crosses its path. Our spirit program is also wind for our sails. We started by selecting a collection of well crafted spirits. Our bar director Nicolas created a tailored list of cocktails that add color, life, fresh ingredients, and complex flavors to the Black Sands Palette. Look down the bar on a Saturday afternoon, or an evening night to see these drinks in actions. We are now serving a short list of brunch cocktails on the weekends, and also have a full spirit list available for individual pours. It will forever be a goal of ours to make you all into home brewers. Learning to brew beer at home literally changed our entire lives, and we want to pass on the knowledge of the most rewarding hobby in the world. We still teach home brewing classes each month right out of our space. In the next few weeks we will be posting the October class on our event calendar. We have also been taking the opportunity to grow the educational aspect of brewing by doing collaborations with other friends and organizations around the city like Gravel and Gold and Grisette Nouveaux. As always stop in on Saturdays and Sundays for your homebrew supply needs or order online. There are also educational resources and info on our website. So… Hi there. Its been a few months and well… we wanted to just sit down and talk about “us”. At this point in our relationship we think you may like us?… We just hope you do like us, because it feels like we might really have something here. And well… we think about you a lot. Its so cute that you borrow our tee shirts, and we even got you your own mug for coffee. And your so thoughtful when you open our beer for us at the end of a long day. We just wanted to say that things are going so well and we’re really happy. Whew! So glad we talked about this! Really though, we are making some cool stuff if you ever want to take a piece of us home with you, or gift it to a loved one. There is sure to be a beer pirate in your family. A big thank you to everyone who participated in our Beer for Life program. We have served many a free beer to our contributors. If you have questions about your account please email us blacksandsbeer@gmail.com. If you are a contributor but have not yet signed up you can follow this link to check your account status. Thanks to All! We now have a full hull. At the end of last month we had the ship built, but still on land and with no crew… no cargo. This last month we filled this ship up with beans, barrels of ale, dark and light spirits and food for the voyage. Then we sourced a full crew to man the deck and trim the sails. Onward. Our Marzocco espresso machine is installed and working. We are literally days away from starting to serve the morning commute with caffeine and breakfast. We have hired a great staff of baristas, secured our pastry partner, and built out a fantastic menu of breakfast items. Think about a house made Hawaiian doughnut with a freshly pulled shot of De La Paz espresso. 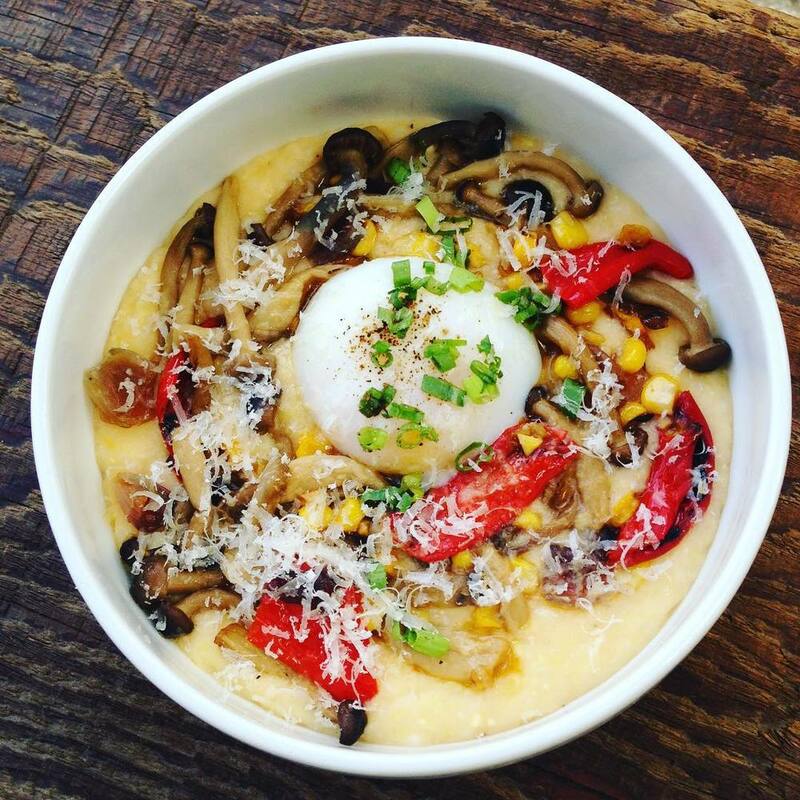 Or a warm latte with our Molokai breakfast bowl… or hey just a black cup of coffee and a high five. also ask about the Matcha… And maybe you’ll even catch us brewing a house beer if you get here early enough! If you have walked by on a late night anytime in the past week you may have caught the sweet aroma of our grains steeping. Last week we brewed 3 batches of beer and they are quickly fermenting. These will be the first real Black Sands beers for all of your mouths. In a few more days we will be packaging our SMASH Nelson, Son of Man black IPA, and our Empire Saison. What could be a sweeter smell than the brewing of a beer on a summer night as you wiggle on by. Our head Chef Eric is just pounding away at his kitchen and really filling it out. Fire inspection and plumbing inspections are passed, and everything is ordered and prepped. Breakfast, lunch and dinner menus are set, and as soon as we pass final health inspection Eric is going to be curing meats, pickling immensely, and firing up the grills. First up is the breakfast menu including a DFT fresh torta, Lanai stone fruit toast, Molokai breakfast bowl, and the Kauai Malasada. Lunch service will soon follow with a healthy kale salad and likely a fried chicken sandwich. Get your palettes ready. We’ve been working closely with our head bartender Nicoles Torres to design out a stellar menu and experienced staff. The list of spirits is growing and the shelves are getting full. We have hand selected all of our spirits from manufacturers who control their entire process like we do. With a great selection of hand made spirits and the experience and creativity behind the bar we think you’ll be loving our cocktail list. Also a big shout out to our friend Matthew Wyne for all the inspiration and great cocktail experiments along the way. Some exciting new coming out of the black sands homebrew shop. With our license approved we outfitted the space with a new fridge. Inside this cold vessel is an assortment of our favorite beers. Now you can grab a tall boy, six pack, or bomber on your way home or your ride to the park. With the bottle shop up and running we are looking for feedback from the daily wiggle folk. Send us an email, tweet or comment and let us know what beers you want, and also when you want the bottle shop open! Why did we build a spaceship on the roof? Which beer of ours won a first place ribbon recently? What do you see when you look UP in the home-brew shop? What is a Zombie Navel? We had to take a slight hiatus last month on teaching our classes. The brewery going in took up all of Cole’s time. This month we are back and we are scheduling the July class for the 18th. Check out our online store to buy a ticket. As we write you all these intimate details of our process it almost seems like the end to us. We have taken what was once a vacant pit of sand and turned it into our vision of Black Sands. But, guaranteed this is just the beginning. There are still a few more surprises, and hopefully a wealth of delights are in store as this black sands ship hits shore. As goes with major building construction, a protective wall is put up to protect people walking by, and also keep people out when the walls literally weren’t there. Well that wall is down. First we tore a section out ourselves so we could get the brewing equipment in. Then we ripped the whole thing down late last week. So now when you walk down you can peek in the windows and see our progress. Once banished to isolation in a lonely desolate warehouse, our beautiful stainless steel brewery has finally crossed the threshold. She is so happy to be clean, plugged in, and starting to socialize again. A few more pipes to connect her to the cooling system and we will be up and running. All the table seating for dining is built. A combination of marble 2 tops, and larger wood communal tables will provide some great cozy spot to enjoy a beer and some food. Beautiful natural hardwood floors are installed over the basement. They cascade up the walls to frame the table seating in the front of the bar. Our hanging lights, spot lights, outside lights, and wall sconces are completely installed and working. So nice to have lights to work with! It’s even nicer to have a toilet, but it feels weird to have a photo highlight of that. We worked with local welders to construct all of our steel counters, and with a fresh powder coat, and a few concrete screws they are secured down and ready to hold coffee, beer and food. The shelving behind the bar and above the kitchen is bolted in. Soon they will be filled with glassware, tableware and spirits. With the shelves installed, we made a few visits to the lumber yard to get the white oak for the shelving. thanks to @techshopSF for letting us use their giant saw to rip the wood down to size. A few more cuts and the shelving will be complete. Our back accent wall where the brewery and back counter meet is freshly painted with a Black Sands mural. 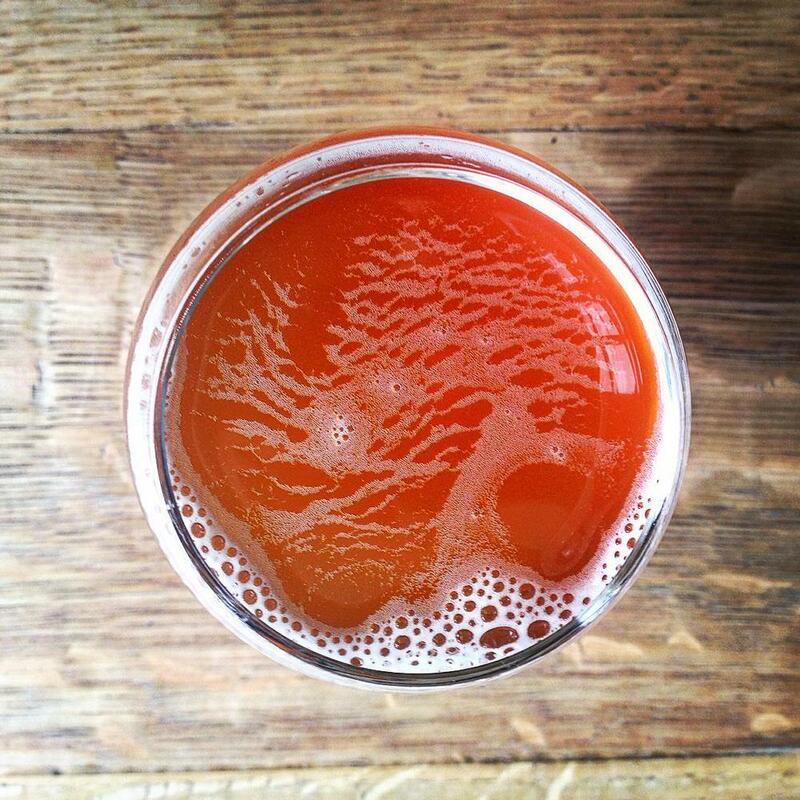 Try to see if you can find all the hidden symbols in the endless swirls of beer. Yesterday we visited our favorite restaurant supply warehouse in Oakland. This time chef Eric Ehler came with us to get his choice layout. The final kitchen appliances were delivered today and should be installed by the end of the week. Eric is hard at work coming up with ridiculously creative and mouth watering dishes for breakfast, lunch and dinner. The kegerators, ice machine, sinks, bells, and whistles are all ordered and being positioned. in a few short days the bar area will be filled out and plumbed. We recently brought a friend Nick Torres on to help us organize and plan for the most optimal bar layout and cocktail program. We're also thankful to Matt Wyne who has been helping us shape the direction of our upcoming cocktails. The nice folks at De La Paz stopped by on Monday (We lured then in with Arizmendi pizza). They stopped in to take a look at our new counters, and help organize and plan the coffee program. Great to have awesome partners to bring amazing local roasted coffee to the Lower Haight. Soon we will have fresh brewed coffee, espresso, and breakfast available for the wiggle commuters. June should be a fun month. A few more inspections, more finishing work, and the gears will start turning. Thanks for your patience and support! A taste of Thailand through a beer. Typically a taste of Thailand conjures up ideas of food and spices. But when we get inspired by Thailand it is about beer. On Thursday June 4th at Woods Cerveceria, Black Sands will be releasing our second beer to the public. Inspired by the small spice markets in Thailand, we brewed up a smoked black cardamom ale. The grains were lightly smoked at 4505 Meats on Divisadero, and the black cardamom spice was uniquely hand dried in a small market in Chang Mai. A recent trip to Thailand inspired a lot of new beer ideas, and we brought back bags of spices to experiment with. Come take the first taste with us starting at 6pm. This is what we have done in 30 days. In early April we literally had no walls. We've covered the entire space with drywall backing, installed the bars, kitchen hood, water heater, garage door, and tiled over 7000 tiles. We are on to the finishing work. 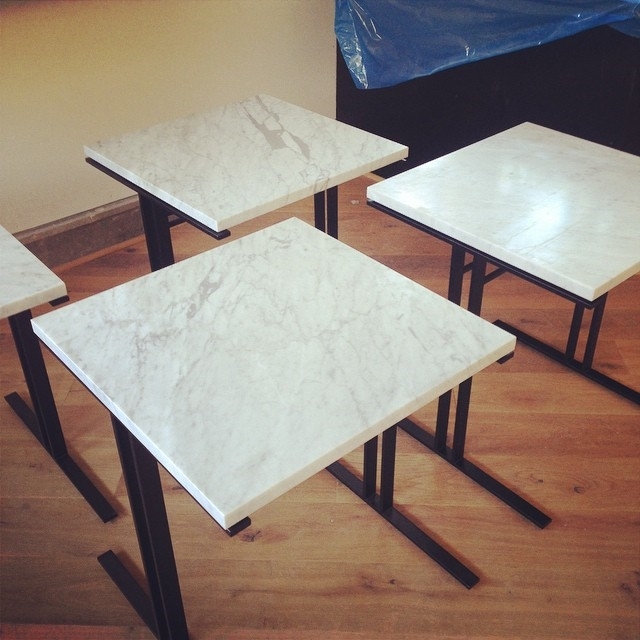 Our full bar and open kitchen counteres are framed in powder coated black steel, and toped with white marble. We have a beautiful new garage door that opens directly in to our brewery. The natural light it brings to the space is really nice too. We ordered a brand new water heater and its all plugged into the water system. It was an interesting day running the exhaust tubing to the roof. After three straight weeks of tiling we have put down over 7000 tiles to water proof the kitchen, bar, and brewery. Finally got this giant piece of equipment off of our floor and into its right place. Everything in it's right place. The outdoor signs are here, welded and powder colored black. We just order the vinyl stickers and they should be up soon. As always the beer recipes are flowing. we are making many test batches especially with the anticipation of the brewing equipment going in soon. This month we brewed a beer in memory of a lost friend, experimented with spices from Thailand, tested out the viability of new dual purpose hops, bottled 5 gallons of an ale to age for 6 months, and foraged from local trees for a fruit beer. Stop into the homebrew shop anytime to talk about beers, and what we have in planning. A final gravity reading on our bohemian pilsner. This beer is in memory of Jay Johnson, and will be poured seasonally in his honor. We climb trees a lot. This month the loquat is perfectly in season. It's little known but grows all over the city. This time we came down with 25 pounds of fruit and their going into a galaxy hopped saison soon. We often travel down the street to 4505 meats for some meat, but occasionally we smoke some barley for our beers too. This time around we made a smoked ale, and we're aging on black cardamom that we brought back from Thailand. Short rib and brisket burger. Caramelized onion mayo. Korean fried chicken wings with cashews and fresh peas. Croque madam grilled cheese with crab sauce and fries egg. Crispy rice salad with asparagus and fresh radish. Nori chips with smoked trout dip. Hand pulled cold noodles with pork belly and soft boiled egg. Our drink program is well underway. We have attended multiple tastings to narrow our collection of signature cocktails. Working closely with our friend Matthew Wyne, he has creatively infused each cocktail with ingredients directly from our homebrew supply store to lend a unique flavor profile to each recipe. Here are just a few to wet your appetite. Gin, Mosaic hopped Tonic, fresh lime wedge. Irish whisky, dry vermouth, fresh kiwi, mosaic hopped honey, and grapefruit hopped bitters. Irish whiskey infused with roasted barley, fresh Bosc pear and clarified milk. this one is undeniable. Some exciting things going on lately. Last weekend we had a large pop up sample sale to open the space up. We hosted a collection of clothing lines in a large sample sale inside our raw space. If you came by it was a cool opportunity to see our space in action. We are also heading to the National homebrewers conference in mid-June to catch up on industry trends and share beer with homebrewers from all over the country. We will be pouring our homebrew beer at the club night for the SF Hombrewers Guild, so if you are headed to san diego for NHC come say hi! Black Sands is also the official sponsor of the latest SF Homebrewers Guild SMASH competition. Over 45 entries are being dropped off for tasting and judging over the next few weekends. The judging will happen soon and a winner will be announced at one of the upcoming guild meetings. The winner will have their beer brewed on our system for all to taste. March was filled with hands on work. 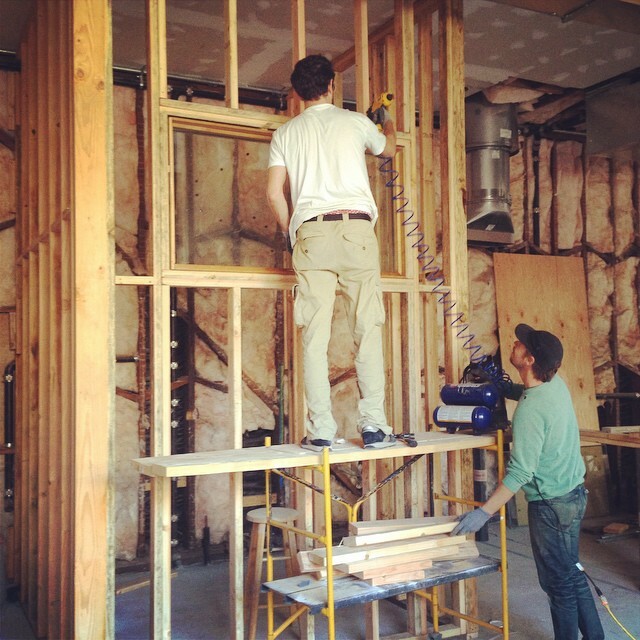 We are building our brewery and bar from scratch, brewing test batches of beer multiple times a week, and custom designing our interior, brand, and merchandise. The home-brew shop is pushing hundreds of pounds of grain, thousands of ounces of hops, and billions of yeast cells into the hands of homebrewers all over the city. Nothing is more satisfying than literally building Black Sands with our own hands, making our own beer, and helping everyone else make great beer at home. First and foremost we want to mark a significant loss we all felt this month. On March 21st, Jay Johnson, owner of the Black Sands Building, Orbit Room and Club Deluxe passed away after a long battle with cancer. Jay was a fantastic landlord to us and always very enthusiastic about our project. He is survived by his equally supportive sister Kym Pipkins. We are planning a beer in his name to give tribute to his efforts and success in SF. Jay will be missed by many. The final structural work and carpentry work is complete. Yesterday we received the building permit to cover all the woodwork with dry wall and water proofing materials for the kitchen, bar, and brewery. With walls covered and water proof we can install fixtures and run the tile work. We are looking forward to speeding up a lot. The garage door and other major appliances are showing up this week and will be ready to install. This month was stacked full of hands on work. Remember how our entire building needed a new foundation? Well the final piece of that work is in. The "moment frames" are gigantic metal beams that secure into the new concrete and hold the Pierce and Haight street walls up. This one goes right over the garage door in the back. We scoured the web and lighting stores for just the perfect lighting materials. As per usual, nothing was just perfectly "Black Sands" so we ordered a basic light, ordered custom steel faces and welded the lights ourselves to our liking, and had them powder coated black. Done, and got what we wanted. 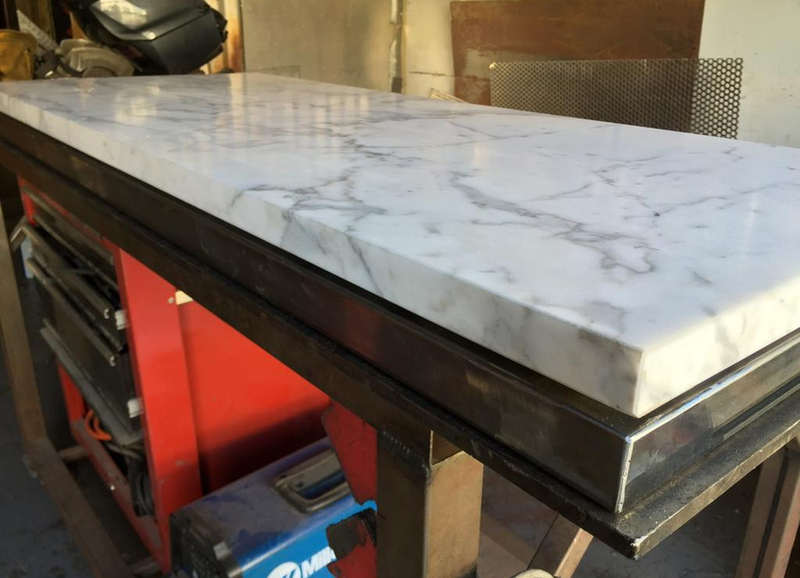 The giant slabs of white marble are going to need some support to ensure they last and hold up over time, we had a custom frame welded to support the heavy stone. It is fitted to our framed out bar and ready for installation. This took an unimaginable amount of time. There was probably over 100 years of paint on the original center support beams in our space. We got out the power tools and sanded each beam to the original natural wood. There is going to be communal table seating in the back by the brewery. We recently ordered a large bulk of oak and are in the process of cutting, gluing and constructing the communal tables ourselves so we can get the perfect fit in the back area. The exterior of the building is trimmed out and has a new fresh coat of paint on it. Starting to feel pretty. As the walls, windows and cosmetics go up we can start to plan more of our interior design elements. More to come on this soon! Our design team is busy creating all of our custom materials and merchandise. We just ordered our beautiful new black on black shirts, diner style mugs for the coffee bar, and currently working on a custom shape for a bottle opener, among many other designed brand elements. Black on black on black. Available at the homebrew store on the weekends or on our online store. Classic ceramic diner style mugs. Drink coffee out of them, or beer. Or better yet, our coffee vanilla milk stout. Available at the homebrew store or online. Currently working on a design for a compact keychain bottle opener. Hopefully in production in the next few weeks! For a soft landing on white marble, these coasters are currently in production. Coming to a cold glass of beer soon. Homebrew Store Now Delivering Weekdays! With our online store you have been able to place orders during the week for easy and conveniently pickup on Saturday's and Sunday's. We are now expanding online orders for quick delivery during the week, and will courier the order directly to your door! Simply place your order in the online store and add an additional item from the delivery category based on your delivery zone. Please also include any notes about delivery time or place. We are beta testing this delivery service over the next few months so please try it out if you are interested and provide any feedback you might have as we work out the kinks. This month we are sponsoring a local homebrew competition. The San Francisco Homebrewers Guild members are all picking up yeast pitches from Black Sands and each making their own SMASH beer for a chance to brew it on our system. SMASH stands for single malt and single hop, and the winner of the competition gets to brew the beer with us, and have it on tap at Black Sands! The Lower Haight Art Walk was a blast. We had a group of local artists post up outside the construction wall and paint a new mural. Very trippy results. Swing by and check it out before it inevitably gets covered in graffiti again! Interested in beer making but not sure where to start? We love maintaining a beginner’s spirit and are eager to help those interested in beer making. Join Black Sands Brewery and Supply for a day of educational homebrewing. Observe our head brewer Cole Emde going through the entire brewing process from choosing a recipe to pitching the yeast. Learn about the process of all grain homebrewing and get tips and tricks to making great beer at home. We will provide everything that is needed, including a recipe and all the equipment and ingredients. Each participant will have the ability to observe the brewing process, ask questions, take notes, and leave with a 10% off coupon for our homebrew supply store. Our first class will be held around mid April. Stay tuned for the exact scheduling, or email us directly if you are interested. One very important lesson that we live by is to find the time. Time to progress, time to cool down, time to get out of your element and out of your head. Even with the crazy amount of work we have to do, less would get done if we didn't get up at the crack of dawn for a surf, or jump the fence to the new skatepark before hours. So here's to working hard and playing hard. 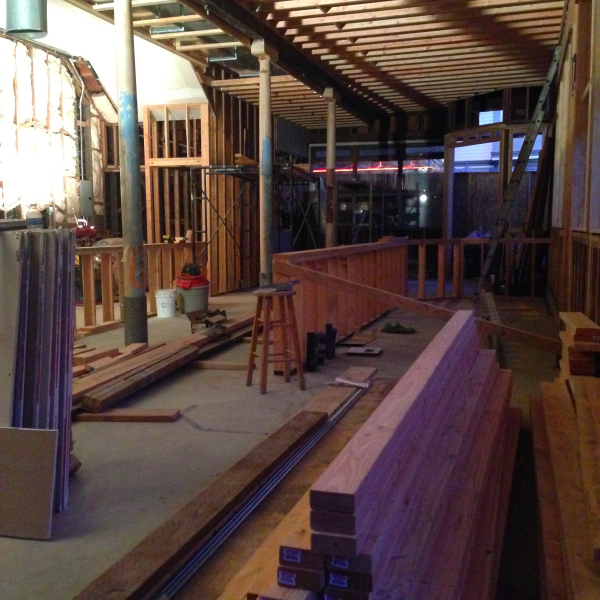 If you’ve peeked your head into our space lately you have seen a huge amount of progress happen over the last 4 weeks. At the end of last month we had just poured the last of the concrete in the basement and the Haight street foundation wall. With the concrete and structural work done we have been very busy framing and running plumbing and electric. Now that our creation has ground to walk on we move to the next step. Carpentry work now frames out all of the major interior walls and spaces, and we are nearly complete with the plumbing and electrical wires that run through that skeleton. In the last four weeks we have really seen our space start to build out. Our brand new basement is a huge improvement of storage space, and has the nice hum of well pumps pulling wiggle water out of the ground. We have framed out the woodwork around the three entrance doors, bathroom, kitchen and bar area. The floor above the basement is completely built out and you can walk around the entire floor plan. Also we installed brand new sound proof windows on the pierce side of the street. On top of all that carpentry work and new structures we are nearly complete with the plumbing and electrical work that runs through the new wood beams. As the inner workings of the building are far along, we are moving into planning the finishing layer of the space. White marble and gray steel for the bar, natural woods for the floor above the basement, and clear finish for the cement floor. We also are making custom wall sconces for soft mood lighting and have ordered beautiful minimal hanging chandeliers for the front entrance way, and custom glassware for the bar and coffee shop. 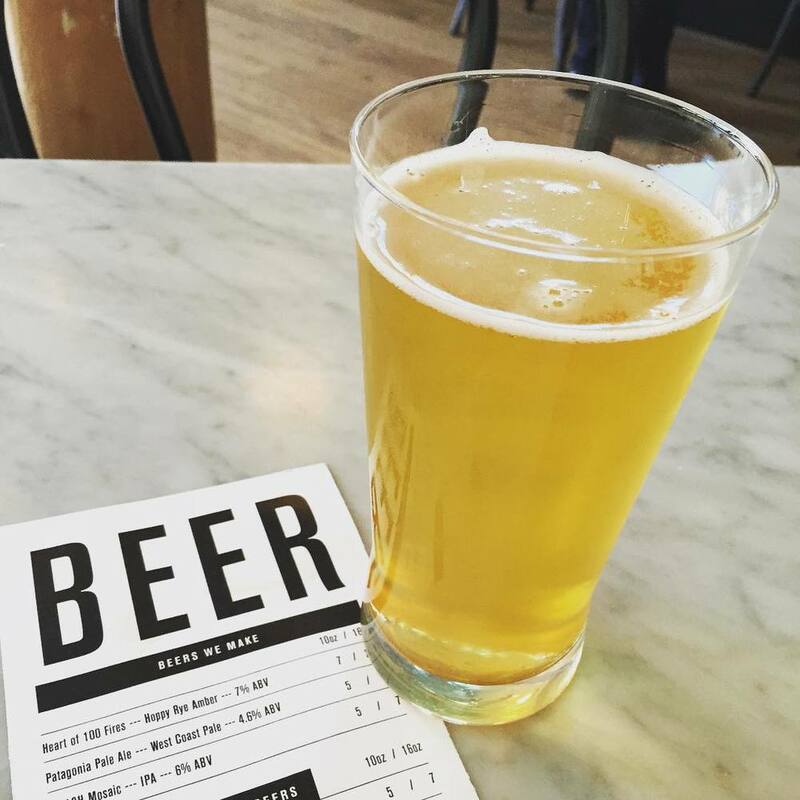 With February hosting San Francisco Beer Week we were very busy this last month. We hosted the well attended collaborative release of our Black IPA at Cerveceria. Sold out quick! Thanks in huge part to our friends at Cerveceria we released our first beer through a collaboration on February 9th. A big thanks to the fine folks and brewers at Cerveceria for allowing us to collaborate and brew our first public beer there. We had a great turnout and had a lot of fun. The Lower Haight Art Walk is scheduled for this Saturday, March 7th from 5 to 9pm. Explore through the Lower Haight and swing by Black Sands for music, a peek inside the space under construction and live mural painting!! We'll be answering questions and giving tours! Last month we worked towards perfecting a few of our recent recipes, as well as continuing our experimentation with new varieties. Our Summer hefeweizen “Mist and the Madness” was brewed again in anticipation of some sunnier days later in the year and we evolved our vanilla milk stout with coffee and cocoa nibs. We have been experimenting a lot with nitrous lately also and the types of flavor profiles we want to infuse with the smooth carbonation we get from nitrous infusion. We are working on a collaboration beer with our friends at the Boba Guys that infuses muscat oolong tea with a smooth milky profile from the nitrous gas. We also have a new creamy, rich, and bold brown ale with milk sugar poured on nitrous that is reminiscent of perfect caramel confections. Look for all of these beers in the coming months! We're moving full steam ahead and eager to get going! February Updates! The First Taste! Black Sands Black IPA! will be tapped during San Francisco Beer Week for a special collaborative release with the fine folks of Cerveceria! We are excited to announce that although our brewery is not yet operational, we have collaborated with Cerveceria on 18th and Church to release the first ever Black Sands beer to the public! Thanks to our awesome friends at Cerveceria we brewed a double batch of our Black IPA and we will tap the limited release on Monday February 9th. The Son Of Man Black IPA is a a dark, stormy combination of roasted and chocolate malts. Balanced rich malty flavor with citrusy hops and floral aromas. If you don't like Black IPA's then you haven't had this mouth punch stout/IPA combo! 6.9% ABV with an IBU of 60! The beer will be tapped and available all day until it runs out. As we pound through our building, things are starting to shape around us. At this point we are not leaving anything untouched. We poured a brand new concrete floor last month, and by the end of next week our basement will be done. We dug down about 4 feet, hit an underground river and submerged multiple pumps to drain the water. With the water drained, we wired up rebar and poured new concrete walls. Next week we anticipate the windows going back in, and soon after we will be taking down the temporary construction walls. With the foundation and concrete work coming to a close, we are taking action on sourcing all of the materials for the interior space. We have previously rendered the space in 3D to help narrow down the choices, but there is still a lot of devil in the details. Just last week we decided on white marble, and stainless steel for the bar countertops, and natural hard woods for the floor above the basement. Seeing the material samples makes it feel very real. We just placed large orders for stone, metal, and wood, so we’ll be ready when the carpenters are done framing out the bar and walls. We have been actively participating in the local neighborhood and merchant group LOHMNA (Lower Haight Merchants and Neighbors Association) to help with community improvements and events. There are some really exciting projects going on to improve and beautify lower haight. There are historical markers in planning, better street lighting, sewer and water runoff improvements, and community events. We are currently working with the art walk committee to donate the Black Sands space to house a community art project. During the next art walk in March we will open up our space to the public and facilitate the creation of a group art project. Any and all are invited to participate. As March gets closer we will send out additional details about this event. Hope to see you all there! The home-brew pop up store continues to be an active buzzing of beer talk each weekend. We place large orders of hops, yeast, and grains each week to keep home brewers stocked with the ingredients they need, and we have been building out our equipment inventory to service more advanced brewers. We constantly look at the space and our offering and find better ways to make it work. We have rearranged the layout in the new year to accommodate more inventory, including kegs and CO2 tanks. We started our recipe share program and have anchor steam and magnolia beer recipes available for anyone who wants to recreate great beers from local breweries. Our first class will be held on February 7th from 10am - 4pm at 3378 18th Street in San Francisco. Participants classes are $50, and there is a total of 12 participants. First come first serve on class signup. The bar at Black Sands is going to be about more than beer. We will of course be manufacturing our own craft beers on premises, but we have a full license to serve liquor as well. Our vision for the cocktail program is to intertwine it with the quality ingredients we use to make our beer. We are developing a unique program with our spirits to infuse them with floral and fruit aromas and flavor them with house made syrups from our grains. We are excited about bringing this unique approach to our cocktail offering at Black Sands. We're working with awesome bartenders , mixologists to develop unique spirits to offer along side our beer! 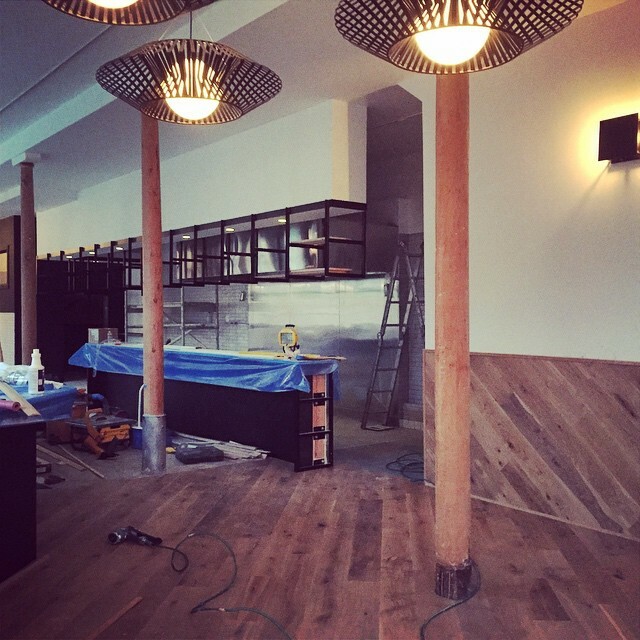 If you have been by 701 Haight in the past month you have noticed that there is a ton of progress happening. We went from a mostly silent construction site to the bustling orchestra of jackhammers, drills and clanking shovels. We are officially a structurally sound building! The photo might not look like much but the building is on its way to a long 2nd life! 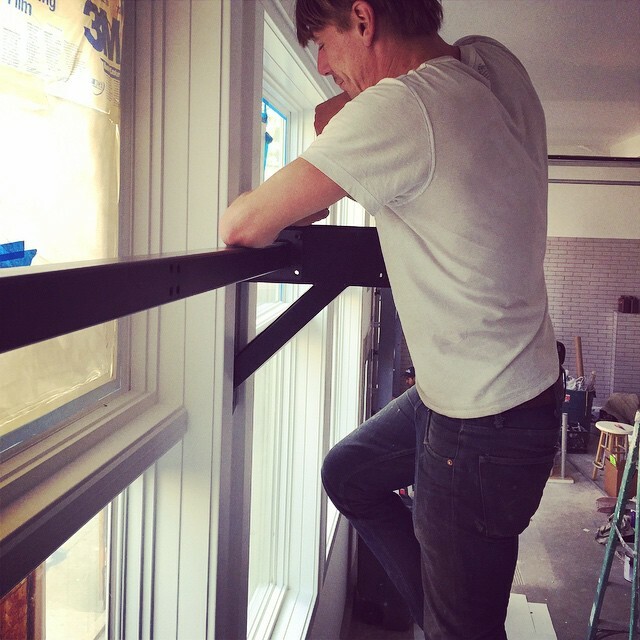 This month we dug the floor and basement out, framed and poured new concrete for the foundational walls, rebuilt the pierce street wall with new garage door openings and large windows, and last but not least, removed the cribs to open the space back up and allow the building to stand on its own again. Thats more progress than we could ask for in a single month. We are looking forward to another orchestral month in December that finally gets back on track to opening! The majority of the foundational concrete has been poured and the building is standing on its own. The wiggle river is flowing directly under the building so new plumbing and pumps are being installed to deal with the natural water source underneath. We’re working with our plumber on ways to hopefully use the water stream for cleaning purposes, gardening and even potentially filtering for use in beers. Literally there is Black Sands under our building! The building is finally structurally intact and improvements are being worked on. The new structural changes in the building have allowed us to make some exciting changes to the layout that we hope will provide for a better service offering. The brewery is being expanded and the ADA ramp is being incorporated into a front entrance with a level ground floor design. We’re working with a local metal worker to provide new tables and bars to better accommodate customers! We’re excited and while it may still bit off things are finally starting to really move inside! The best part of brewing beer is that you have so much to experiment with. The best part about doing it in San Francisco is all the interesting people that are willing to help you with cool ideas. We have been very busy brewing beers at a homebrew scale to test them out, and if they are good they will likely hit your lips soon. Here are a few of the beers and collaborations we have done in the last month. We are brewing up a bike friendly Wiggle beer. Inspired by the famous bike route our building is on, we call it least resistance after the the underground river that made the wiggle what it is. Least Resistance is a session black IPA that is low in alcohol, but tastes full flavored with chocolate and coffee notes and a good bitterness. It’s like a shy younger brother of our black IPA that you can have a few of and still get on the Wiggle and be safe. We brought this to the homebrew share at PI bar sponsored by the SF Homebrewers Guild. We also were happy to hand out gift certificates to the winner of the homebrew share. Coffee meet beer. We met with our coffee roaster a few months back and brainstormed some ideas on a collaboration beer. With a bag of freshly roasted beans provided by our friends at De La Paz we made a rich, flavorful coffee milk stout. A little lactose sugar for milk flavor and consistency, and aged on whole vanilla beans and whole roasted coffee beans. We will just say that this batch didn’t last long at all. Thanks De La Paz for the fantastic coffee. There is only one thing that might be better than beer and that is smoked meat. 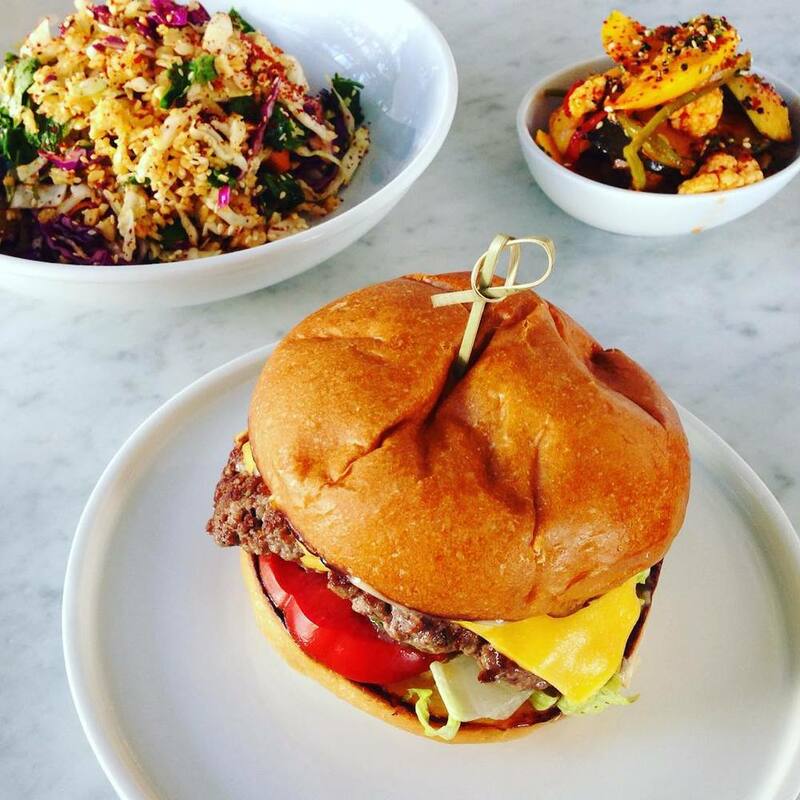 4505 Meats on Divisadero and Grove is one of our favorite spots. We have been talking to them about carrying Black Sands beer on tap for quite some time now. Even though we can’t give them kegs of dark rich beer for BBQ pairings… we had another idea. We took grains over to them from our homebrew shop and smoked them for 3 hours right inside their meat smoker. The result was some amazingly aromatic and flavorful BBQ’ed grains. We used them to make a robust smoked porter that is currently fermenting. Looking forward to tasting it, and collaborating more with the awesome folks at 4505. Thanks meat smokers. There is a great new book out called The Brewer’s Tale. It is by a local author named William Bostwick. We met will at Cerveceria and quickly over a beer decided his book belonged in one of our kits. We pulled a great medieval herbal ale recipe that William wrote and gathered the ingredients. The kit includes everything you need to make Will’s ancient beer recipe and a copy of his new book The Brewer’s Tale! We are seeing an increase in the amount of homebrewers coming into the homebrew store each month and we’re busy all day Saturday’s and Sunday’s teaching people how to brew their first batch, or helping with their hundredth. Here are a few new things going on in the shop. As part of our commitment to transparency and open sourcing beer, we have our entire library of recipes online and it’s growing day by day. All the recipes are in the store for free and we have an entire section of our website where you can download recipes. We will be growing this out and expanding with our recipes, other home brewer’s recipes and even local breweries who donate recipes. Kits are running out the door. We debuted our first homebrew kit last month, and since then have nearly sold out of our first run. We also have scaled up our variety of kits. we now have 4 different kits. Choose from a SMASH Nelson IPA, Chocolate Milk Stout, Belgian Saison, and our collaboration recipe with William Bostwick Elder Fire. We even put together a custom label kit for labeling your own bottles. We are pleased to announce that we are an official sponsor of the San Francisco Hombrewer’s Guild. The SFHG is a local group of dedicated homebrewers that we love being a part of. The spirit is all about fun, knowledge sharing, and community events. Its a great organization to be a part of if you are heavy into beer and homebrewing. All members of the guild get a 10% discount off of their orders at the homebrew shop. Our first class will be held on December 13th from 10am - 4pm at 3378 18th Street in San Francisco. Participants classes are $50, and there is a total of 12 participants. First come first serve on class signup. We’ve always supportive of any press or support from journalists and publications. We’ve been featured this month in the coming magazines! Want to learn how to expertly homebrew? Want to see what this whole "all grain" thing is about? Join Black Sands Brewery and Supply for a day of educational homebrewing. Observe our head brewer Cole Emde going through the entire brewing process from choosing a recipe to pitching the yeast. Learn about the process of all grain homebrewing and get tips and tricks to making great beer at home. We will provide everything that is needed, including a recipe and all the equipment and ingredients. Each participant will have the ability to observe the brewing process, ask questions, take notes, and leave with a 10% off coupon for our homebrew supply store. Visit our online store to purchase your ticket! * please note that this class is observation only and does not allow you to take home any beer. * class dates and location may be subject to change. if for any reason a class date or time needs to change, we can offer a full refund. November Newsletter - Silver Linings! We are wrapping another highly productive month on the journey to opening Black Sands. As you are very aware, the building is under full construction these past few weeks, and we are excited to share a myriad of updates with you. We know how patient you all are being, and trust us, we are just as anxious to get open and start serving you great tasting beers. But, with the additional time and effort, there are some great silver linings! The extra time and attention is going to pay off. We have reorganized the floor plan to maximize comfort and seating. We have a more efficient and better access to our brew house, including a plan for roll up garage doors that open right to the brewery. The structural work on the foundation will ensure a safe building for years to come, and we will be getting a more modern and beautiful concrete floor for the entire building. We also have a larger bar area, seating right up to the kitchen, and a window to serve coffee to outside patrons. The extra time and effort is going to pay off. First of all, we are happy to see a lot of progress happening on the actual building construction. 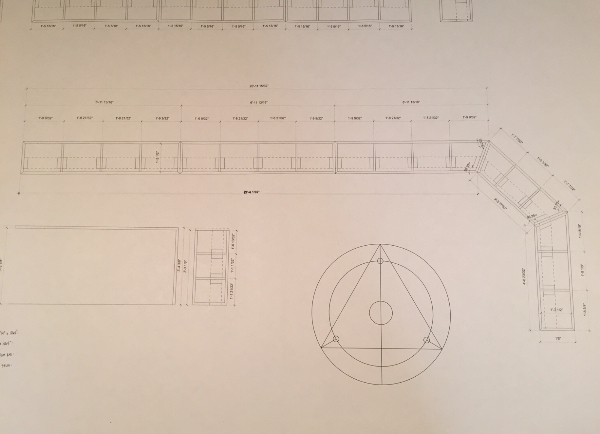 It took us quite some time to redraw our architectural plans, get the building evaluated for structural improvements and resubmit our plans to the permitting department. The planing is behind us, the floors are ripped up, walls are down, and steel enforcing beams are going in. We are working towards applying for better outdoor spaces, and more bike parking. We meet often with the SF bike coalition, and recently applied for new bike racks with the SFMTA which were promptly installed. Thanks SFMTA! As time goes on we will be looking for other ways to improve our outdoor spaces and bike parking. During construction, there always tends to be some less than exposed walls. We saw a large blank wall and couldn't help but paint it black. We like keeping the neighborhood beautiful, and as artists we can't resist a blank canvas. The murals are a great way to beautify the construction and also a way to discourage graffiti. So we made calls to local artists and friends to cover the wall with murals. An art project called "Looking For" from local artist. Some great coverage in Bold Italic about the mural. And we finished the last bit of free wall space with our own mural. One of our major initiatives at Black Sands is to open source beer. We want to spread knowledge, create a community and teach homebrewers that they can make great beer at home. We recently launched a whole new section of our website that has all of our recipes for homebrewers to download and make themselves. We also just initiated a new project to involve all the local SF breweries in a recipe sharing program. We have asked each brewery to donate recipes so that homebrewers can make beers from popular breweries around the city. We are happy to announce that we already have a great response from breweries wanting to participate. Soon we will have recipes for homebrewers from the likes of Magnolia, Southpaw, Headlands, Cerveceria, Thirsty Bear and Barrel Head! More information on this soon. e have lots of demand for easy ways to get into the amazing hobby of homebrewing. So much that we started making our own custom brew kits. Our first kit is a signature SMASH beer (single malt and single hop) that makes getting into homebrewing easy with a great tasting result. The kits are available in our store, and just recently we signed up another retailer, Gravel & Gold, to carry them as well. We are currently in talks with a few other places, so hopefully you will see Black Sands beer kits all around the city soon! Just in, Black Sands T-shirts! come get em while they last! Pure black beautiful tees for all sizes. Available in the store or online. We had a great opportunity to be the sponsor and facilitator of the Sense lab at the recent SF Craft Beer festival. Many a beer enthusiast stopped by to smell and taste brewing ingredients and learn more about homebrewing. We had a great time, and can't wait till next year! October Updates - Pop Up = Oiled Machine! Our home brew supply store pop up has successfully opened and has been operating for four weekends in a row now. Weekend hours are keeping us busy writing new recipes for home brewers, teaching people the process and filling orders for customers. We also opened an online store where customers can place their orders during the week and pickup first thing on Saturday morning. The pop-up is doing great, and driving a lot of traffic to black sands, creating a great local community of craft beer makers. We built out a Learn to Brew to help teach people the process of making beer at home. We introduce the process, ingredients and equipment people will need, and provide downloads of instructions, and checklists to help get started. We are building digital and physical tools for homebrewers that are available on our site as well as in the homebrew shop. With the homebrew store open, we are not only making our test recipes for the brewery, but also creating a number of seasonal recipes to give away to homebrewers at our shop. We make new ones daily to help customers make new styles of beer that they want to try. We also have written detailed instructions for beginners and more advanced brewing processes that are available on our learn to brew page. Recipes for black sands that are in the works now are a vanilla coffee stout and a session black IPA named after the wiggle. Weekends - 10 am to 6pm @ 185 Pierce Street. Look for the Sign and Benches! After a few months of getting additional permits, drawing up new architectural and structural engineering plans the work on the foundation has started. Starting work seems like the beginning, but believe us it is extreemly exciting to be breaking ground. Right now the floor is being ripped out and soon we will be pouring a brand new concrete floor for the brewery. If you walk by you will see the temporary wall that has been erected to contain the construction work. This weekend we are sponsoring a local artist to make the wall more aesthetically pleasing, and discourage graffiti. The Black Sands homebrew shop is gaining exposure, and we are already being invited to special events around the city to lend our homebrewing expertise. The SF craft beer festival has invited us to participate in their festival and help teach people how to sharpen their senses by tasting and feeling different beer ingredients. We will be running the Sense Lab at the festival on October 18th at Fort Mason. With our homebrew store officially open, we are rolling out as many tools and tips as we can to help homebrewers make great beer at home. We are excited to launch something we have been working on for quite some time. The new section of our website that is dedicated to teaching homebrewers process has just launched! It covers the basics of what goes into beer, how it is made, and provides you with recipe sheets, equipment descriptions, and instructions to follow to make beer if you are new to the process. 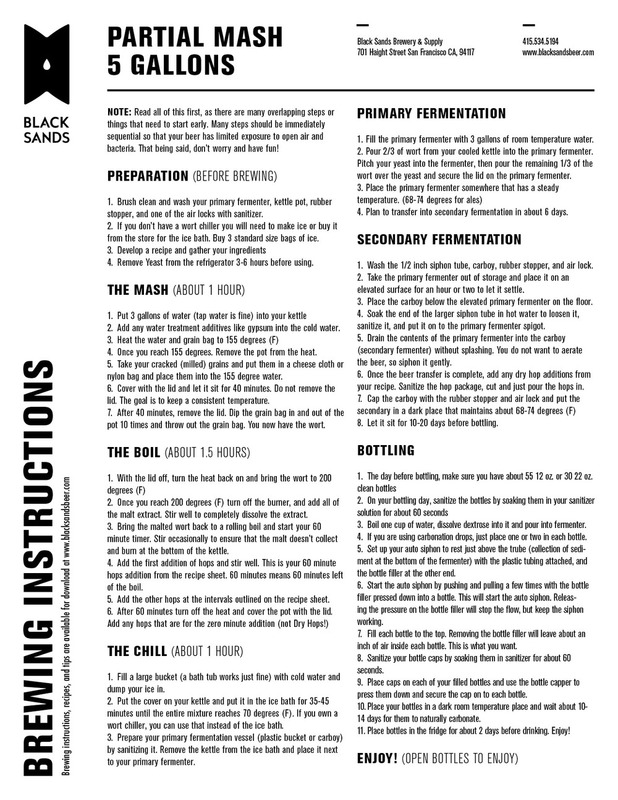 Check out the brewing instructions below, download them for yourself, or check out the learn section for a more in depth look. September Updates - Pop Up Homebrew Shop Open! August was a month of planning and progress. Our primary task right now is giving our building a strong foundation to make our customers, the neighborhood, and the beer safe. While we plan for a safe and secure foundation under the building, we've also expedited the opening of our homebrew shop. Black Sands is brewery created by homebrewers for homebrewers and we are opening a pop up homebrew supply store this Saturday, September 6th! 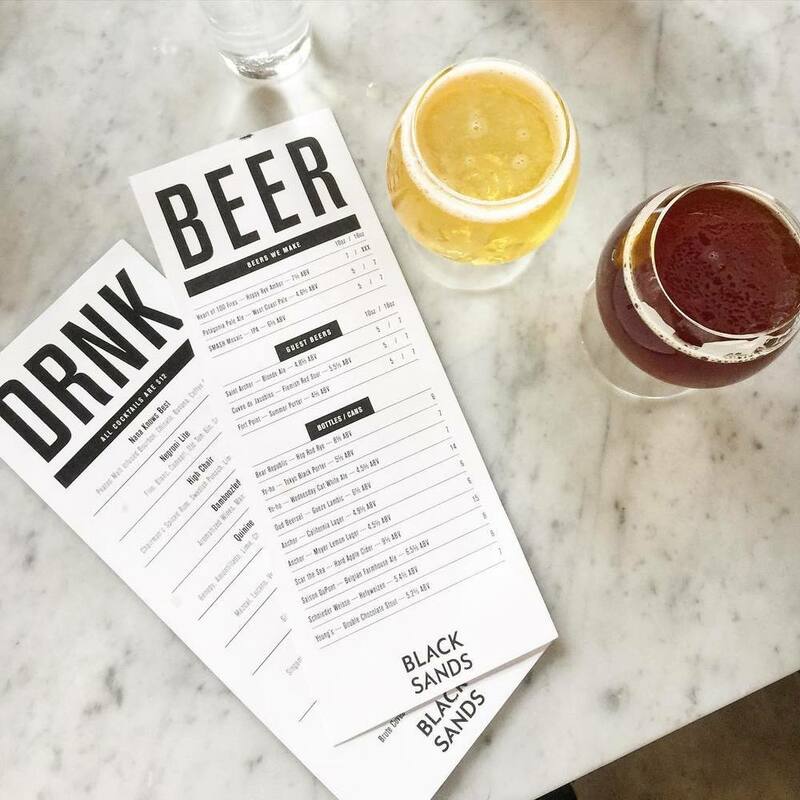 The Black Sands homebrew supply store will provide a central location for home brewers in San Francisco to get all the ingredients and equipment that they need to brew quality, great tasting beer at home. We have everything from advanced brewing equipment to beginner kits. If you are an experienced homebrewer, we will provide all the hops, yeast and grains to make the beer you love to make. If you are a beginner, we have the knowledge, recipes and information to get started and have fun doing it. Initially the pop up shop will be open on weekends from 10am-6pm. We will be gauging customer needs and potential additional hours during the weekdays. Our head brewer Cole Emde will be running the homebrew shop and available for help, advice and assistance. The shop will be at our location, towards the back of our building on pierce street. So come stop by, grab some homebrew supplies, Black Sands beer recipes, or just to say hi! Weekends - 10 am to 6pm @ 185 Pierce Street. Look for the Sign and Benches! Beer has just a few basic ingredients; water, malted grains, hops and yeast. Our homebrew shop will provide a variety in all these categories from all over the world. We are carrying 5 base malts, and 18 specialty malts from North America, Europe and even the Patagonia region. Our hops selection will include all the major staples from Yakima Valley and Europe, as well as rare and new upcoming varieties from New Zealand and Australia. Our yeast selection includes the necessary staples of dry and live cultures with a great selection from local california yeast producers GigaYeast. The Black Sands homebrew shop will have everything for local homebrewers to make their favorite recipes at home, and the variety to experiment with new things as well. Homebrewing can be done with very little experience, but is also a complex hobby that can keep even the most advanced brewer interested. We'll carry all the basic equipment to brew beer at home, as well as some nice bells and whistles that will make the advanced brewer's life a little easier to brew, clean, store their beer. Beginner brewers can pick up a starter kit, and a custom recipe, while advanced brewers can get upgraded equipment and advice for improving their process or recipes. The Black Sands homebrew shop is a place for learning, sharing, and making homebrewing a fun and easy hobby for everyone to enjoy. We welcome all levels of experience, so stop by if you're an expert, or just interested in getting started. As you may know our construction has been delayed due to foundation issues with the building. The good news is the landlord has started construction, permits have been pulled and work is ongoing! We look forward to continue our construction and tenant improvements to buildout the full brewery and bar in the coming months. Shoring is complete and new drilling has started to start the work on replacing the foundation. We'll be getting a new concrete slab, a deeper functional basement and seismic updates to make the building safe for generations to come! Thanks and hope to see you at our Homebrew pop up!